Place two 1/2" loop clamps on rear left side of bike frame, one clamp to top support, one to bottom support, flat side of clamp facing outward. 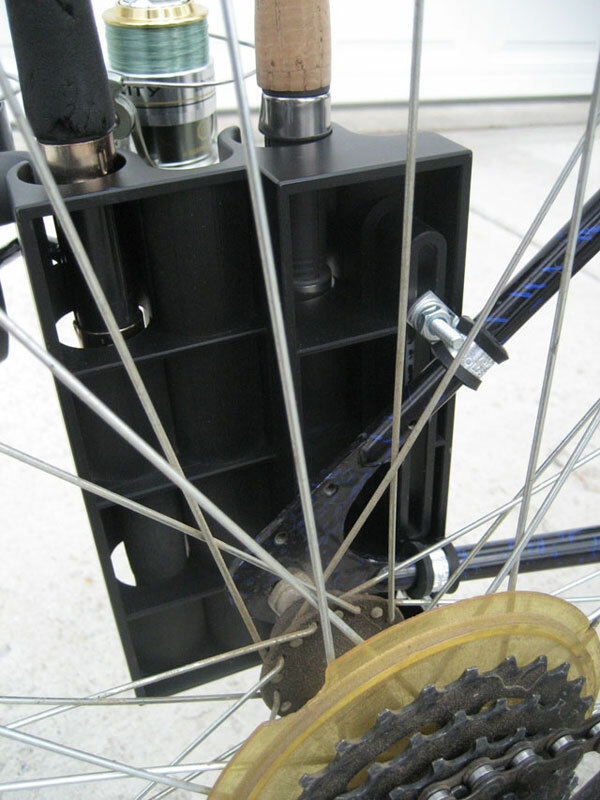 Put 12 – 24 x 2" screw with flat washer thru bottom hole of rod holder. Place screw thru clamp, and install lock washer and nut, (Do Not Tighten). Place 12 – 24 x 2" screw with flat washer thru slot in rod holder. Put screw thru clamp and install lock washer and nut. Slide holder back until thick part of rod holder nearly touches axle nut. Adjust angle of rod holder to desired position and tighten the 2 screws, Do Not Over Tighten, only needs to be snug. If 1/2" clamps are to small for bike frame use the two 5/8" clamps provided. Clamp holes can be downward on bottom support and upward on top support or reverse for wider range of adjustment, if needed. 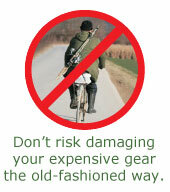 Secure with strap provided after fishing rods are inserted.